Here are some of the events and outings that TALK San Francisco has planned. San Francisco Giants Baseball game. Although we don’t have the date for this, students will be advised well in advance so that plans can be made to attend this always iconic San Francisco sporting event. San Mateo Movie Day. San Mateo is a city in the high-tech enclave of Silicon Valley. Great movie complexes in the city ensure a wide range of the latest and best movie releases that our students enjoy armed with some popcorn and other treats from the concession stand! history in the world, housing over 26 million specimens. It boasts a world-class planetarium, aquarium and natural history museum. Located in Golden Gate Park, its exhibits include the Rainforests of the World the Philippine Coral Reef, Water Planet, and a roof garden of native plants, podcasts, live penguin cams, and more. The Academy is the oldest scientific institution in the western United States, founded in San Francisco in 1853. Golfing Driving Range – Mariners Point. For those would-be golfers or just for fun, a trip to the golfing range at Mariners Point makes for a memorable time for our students. The atmosphere is great, with locals providing welcoming vibes and entertaining banter! A Trip to Six Flags An overnight visit to Six Flags Magic Mountain, just north of Los Angeles, is always a winner with our students. 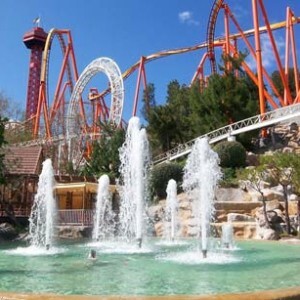 Six Flags is a state-of-the-art amusement park with Four roller coasters, scary or thrill rides and fantastic water attractions and rides. August in San Francisco and surrounds promises to be fun, fascinating and memorable.